It all started some twenty years ago when Nelson Chu was not satisfied with existing paint systems, in which brushes were often a blob or some pixel-sized strings. Resulting strokes often look too clean, too sterile. Our goal is to be able to make organic strokes - just like in the real world - in real time and high resolution. Our development is directed by leading digital painting tech expert Nelson Chu. He devised break-through techniques for simulation brushes, wet (watercolor & oil) and dry media. Being a painter & calligrapher himself as well as a computer graphics specialist, he understands what can be done to improve the state of the art. 1995 - Nelson Chu sprouted the idea of simulating a Chinese brush. 1999 - Nelson started working on brush simulation at HKUST. 2002 - Published technical paper on brush simulation at Pacific Graphics. 2003 - Nelson started ink simulation research. 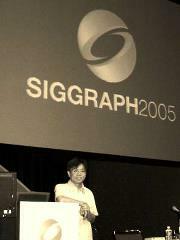 2005 - Published on ink simulation at SIGGRAPH. Prototype dubbed MoXi. 2006 - Adobe Systems Inc licensed MoXi. Nelson went to Adobe for tech transfer. 2007 - Sony Electronics Inc licensed MoXi. Nelson ported part of MoXi to Sony's new hardware platform. Nelson awarded PhD for his research. 2008 - MoXi generated visual effect for the Beijing Olympics . Nelson accepted Microsoft's invitation to work on Project Gustav, later released as Fresh Paint. 2011 - Nelson resigned from Microsoft. 2012 - We started the development of Expresii, a successor of MoXi. 2013 - A preview of Expresii demo'ed at SIGGARPH ASIA. 2014 - Expresii in Closed-Beta stage; Expresii Lite released as Public Preview. 2015 - Expresii released as Public Beta. 2016 - Demo'ed at CES ASIA. Nelson invited as panelist at Wacom's Connected Ink. Demo'ed at SIGGRAPH ASIA. Expresii officially launched! 2017 - Microsoft featured Expresii at the New Surface Pro launch events (Global launch at Shanghai, local at Hong Kong & Taiwan). Showcased at SIGGRAPH 2017. Watercolor has been a major challenge in digital painting technology. Many popular paint programs offer "watercolor brushes" but they lack fluidity, which essentially is the charm of the medium. The MoXi paint simulation, on the other hand, brings watercolor simulation to a whole new level using Computational Fluid Dynamics. Coupled with an expressive deformable virtual brush, it gives the serendipity of painting with water-based media all digital artists deserve. We understand what artists wanted and also have the technical skills to make tools that delights them. 'Expresii' is the Romanian word for 'expression'. You can also take it as 'express' + 'yi', where 'yi' is the pinyin of 「意」 in Chinese. 「意」 means 'idea' or 'meaning'.